BENJAMIN WATERHOUSE HAWKINS: Waterhouse Hawkins (seen at left) was a British sculptor of the mid 19th century who teamed up with Richard Owen to create lifesize models of the dinosaurs then known to exist. Owen used the known parts of the skeleton to estimate the size and overall shape of these dinosaurs, and Hawkins sculpted life size models following Owen's directions. It was inside Hawkins' "Iguanodon" that Owen held his famous dinner meeting. Hawkins' dinosaurs were also a prime attraction at the Crystal Palace Exhibition of 1853-54, an event which heralded British industrial ingenuity and power, and marked the founding of the World's Fair movement that continued through the 1980's. 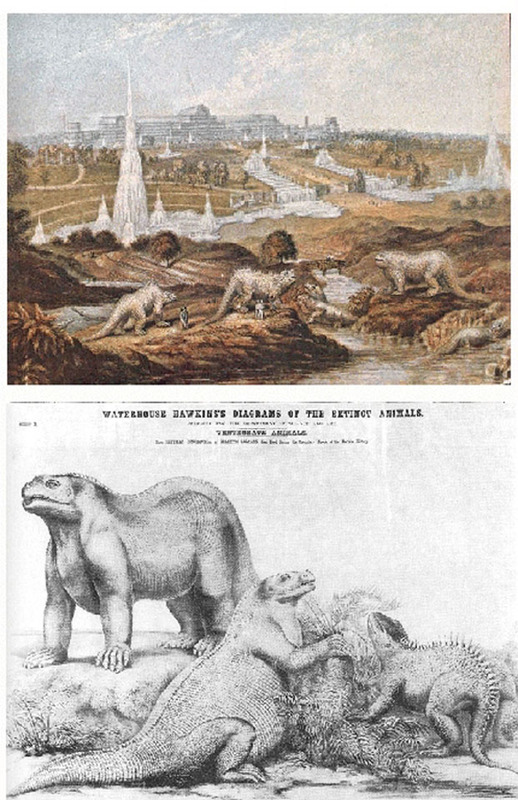 As seen in the pictures at the left, Hawkins' dinosaurs were arrayed in life-like tableaux on artificial islands built in the gardens surrounding the Crystal Palace, which is visible in the background of the upper figure. Visitors were captivated. A stroll through the dinosaur islands was soon a popular part of a visit to this first large, iron girder and glass building, and public awareness of dinosaurs sky-rocketed. Hawkins' dinosaurs were to the mid-19th century what Spielberg's movie Jurassic Park has been to the late 20th - they brought dinosaurs to the center of the public eye. Hawkins' models have outlasted the Crystal Palace, which burned to the ground several decades later. In contrast, the sculptured dinosaurs still stand in Sydenham Park south of London. The figure at left shows the Hawkins-Owen Iguanodon as it now appears. Following his success with the Crystal Palace Exhibition, Hawkins came to New York City with the intent of recreating on one side of the Atlantic what had been so successful on the other. In the years following the Civil War, he set up a studio (shown at left) on what is now the site of the American Museum of Natural History on the upper West Side of Manhattan, and began to assemble a new menagerie of sculptured dinosaurs. The plan was to set them up in a "Paleozoic Museum" in Central Park, which was then being landscaped under the direction of Frederick Law Olmstead, an ex-engineer officer in the Union army. In the left foreground is a reclining Iguanodon. The skeleton modelled at the rear is that of Hadrosaurus, an American dinosaur described by Joseph Leidy in 1858. However, in 1871, before either the park or the dinosaurs were finished, New York City politics intervened. The corrupt Tammany Hall-Boss Tweed machine took control of city politics, and Hawkins and his dinosaurs were out. Those models that had been made were broken up and buried in the south end of the park, and Hawkins left New York a greatly embittered man. Although Central Park has been modified in the years since its inception, including the construction of the 8th Ave subway line which runs up the west side of the park, the remains of Hawkins' dinosaurs have never been found. They still rest somewhere under the sod of Central Park, probably not far from Umpire Rock and the Heckscher ballfields (see picture and Central Park map at left). 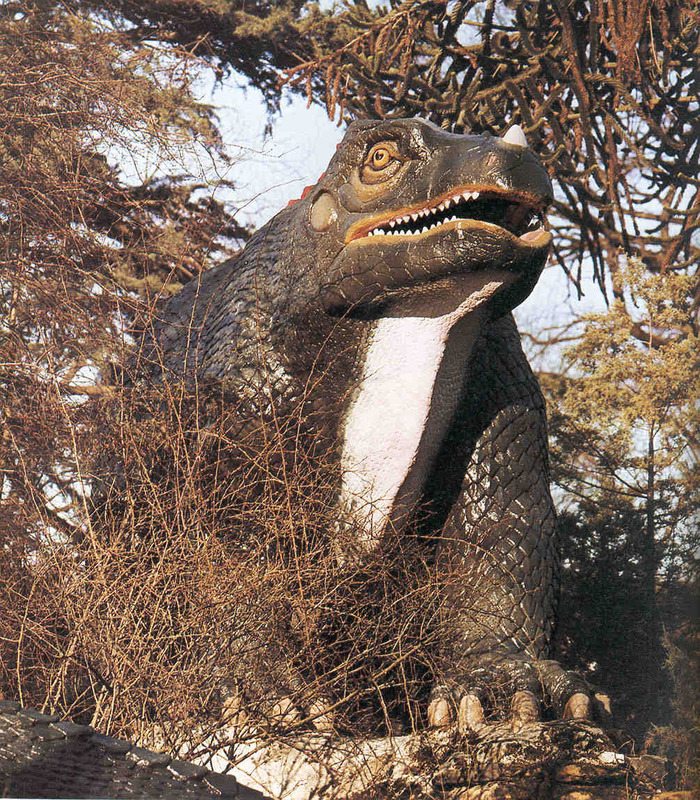 Could one of the pitchers' mounds really be a small embankment covering the severed head of Megalosaurus? Who knows, maybe so.